His introduction to the wonders of the ancient world could hardly have been less auspicious. 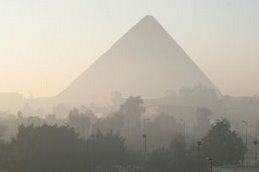 While in Cairo in the summer of 1815, awaiting an audience with Mohammed Ali Pasha, Turkish viceroy of Egypt, the Italian monk-turned-peddler-turned-hydrologist-turned-circus impresario Giovanni Belzoni paid a visit to the Great Pyramid and became so tightly wedged in one of its internal passages that his guides had to forcibly extract him. It was merely the first of many indignities endured by this 6-foot-6 “giant,” whose adventures in the Nile Valley would yield some of the most imposing treasures in the British Museum. They would also earn him the undying enmity of his successors in a field that only later acquired the polish of a professional discipline — archaeology. While granting that Belzoni may be what a colleague has called “the most notorious tomb robber Egypt has ever known,” Ivor Noël Hume, the former director of Colonial Williamsburg’s archaeological research program, also admits to a fondness for this indefatigable entrepreneur.